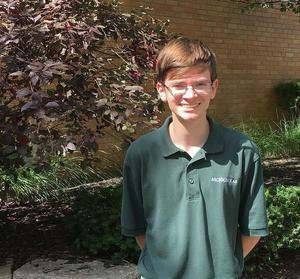 Archbishop McNicholas High School senior Myles Bailey, a St. Thomas More School graduate, earned the highest possible ACT composite score of 36. On average, only around one-tenth of 1 percent of students who take the ACT earn a top score. In 2017, only 2,760 out of over 2 million graduates who took the ACT earned a composite score of 36. The ACT is a curriculum-based achievement exam that measures what students have learned in school and consists of tests in English, mathematics, reading, and science. Bailey prepared for the ACT by taking the prep class offered through the St. Joseph's Scholars program at McNicholas. He worked through practice books and tests offered through that special class but felt that a great deal of the preparation came from the classes and teachers he has every day. "The teachers and the classes who challenge me helped me," Bailey said. "I was prepared for the difficulty of the problems and knew how to approach them." Bailey achieved the top score on his third time taking the exam and felt that the math was the most challenging test of the group. "The reading comes a bit more naturally to me," Bailey said. "Math is a little more challenging because it is a lot of memorizing formulas and repetition." While Bailey has visited several schools and is still deciding on an area of study, he sees Miami University, Purdue University, and the University of Notre Dame as leading contenders for his collegiate home. Bailey is the son of Michael and Melanie Bailey and attended St. Thomas More Elementary School. Congratulations, Myles, on this an outstanding achievement!